Vince: He in some kind of trouble? Danny: Women trouble up to here, but he doesn't think so. 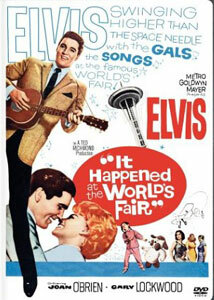 Every Elvis movie needs a hook of some kind, and this time out the hook is the then-topical reference of the World's Fair. The Seattle World's Fair of 1962, that is, with its futuristic themes and the Space Needle, among other attractions. Capitalizing on the fame of the fair, this picture uses its setting pretty well for the most part, while still sticking to the tried and true formula. This time out Elvis is Mike Edwards, a girl-happy cropduster in Washington state who's partnered with gambling addict Danny Burke (Gary Lockwood). When Danny ends up getting their plane seized by the sheriff because of massive gambling debts, the duo heads for Seattle in hopes of garnering a job or two at the Fair, possibly from shady character Vince Bradley (H.M. Wynant) and making enough to reclaim the plane. Along the way they meet Walter Ling (Kam Tong) and his little niece Sue-Lin (Vicky Tiu), who are also heading for the Fair. When Uncle Walter gets called away on business, Sue-Lin stays with the guys to see the Fair. While Elvis tries to make time with nurse Diane Warren (Joan O'Brien), he's rebuffed severely, but Sue-Lin has plans of her own for Mike. Elvis is in better form than usual, despite having a leading lady who generates very little heat or chemistry with him. Much better is the early-on romance between Mike and Dorothy Johnson (Yvonne Craig), which is particularly steamy, aided by a scorching R&B tune, Relax. Indeed, his chemistry with Sue-Lin is better than with O'Brien. Although I usually despise movies that prominently feature cute children,Vicky Tiu has such good presence and rapport with Elvis that it's easy to overlook that generic objection. Gary Lockwood, who would go on to immortality as Frank Poole in 2001: A Space Odyssey is pretty wooden and seems to be looking for a way out of the picture most of the time. Perhaps the most notable supporting player is a young, young Kurt Russell (who would go on to play Elvis himself) as the little kid whom Elvis pays to kick him in the shins so the King will have an excuse to see the nurse again. Image Transfer Review: The widescreen format gives the proceedings an appropriate feeling of spectacle, and the transfer does a very good job of realizing that imagery. Colors are rich and vivid, and detail is quite sharp. There's some aliasing during the cropdusting sequences, and some minor ringing on occasion and a couple of splices, but those are hardly serious complaints for a picture over 40 years old. This looks terrific overall. Audio Transfer Review: The 2.0 mono sounds respectable for the most part. Hiss comes and goes, usually disappearing for the lip-synched musical numbers. The music sounds perfectly fine, with excellent range and little sign of distortion. Extras Review: A gallery of five trailers, presented in anamorphic widescreen, are the sole extras. More subtitles are provided than are actually indicated on the keepcase. The layer change is very halting and poorly placed in the middle of a conversation between Elvis and Sue-Lin. A pretty good Elvis picture, although the leading lady just doesn't strike sparks with him. The transfer's quite nice for a 40-year-old picture, but nothing for extras other than trailers.